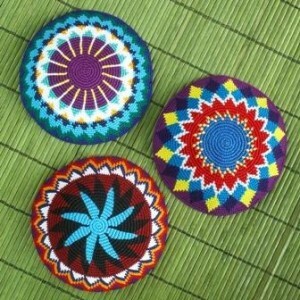 Hand-crocheted, these beautiful and colorful kippot are uniquely different. Sales of the kippot bring income to the 50 women artisans who create them, providing better food on their family table, better access to health care and school for their children. You can make a difference in the lives of a Mayan family! $15.00 – 21.00 depending on size and style. Discounts available for large orders. Can be ordered on-line at the MayaWorks web site.